To understand the future effects of climate change on mammals, doctoral candidate Abigail D’Ambrosia looked back — way back — in time, to an era 50 million years ago when the Earth experienced a series of extreme warming events. She found that even in the lesser of these events, when the Earth warmed only about 5 degrees Fahrenheit, several mammals (Arenahippus, an early horse the size of a small dog, and Diacodexis, a rabbit-sized predecessor to hoofed mammals) got about 15 percent smaller. 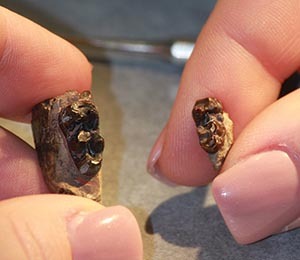 For the study, D’Ambrosia, a student of professor of Earth sciences William Clyde in the Natural Resources and Earth Systems Science program, collected teeth and jaw fragments in the fossil-rich Bighorn Basin region of Wyoming. “This suggests there may be a relationship between the magnitude of a global warming event and the degree of associated mammal dwarfism,” she says. “The hope is that it will help us learn more about the possible effects of today’s global warming.” The study was published in the journal Science Advances.